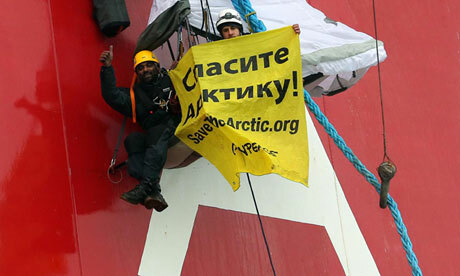 Six activists with Greenpeace International have occupied a Russian oil rig to protest drilling in the Arctic. The rig belongs to the Russian state-owned energy giant Gazprom, which is set to become the first company to produce Arctic oil through drilling operations in the Pechora Sea. Democracy Now interviewed Greenpeace’s executive director, Kumi Naidoo, just as he and other activists are being hosed by the rig’s crew in an effort to thwart their protest. Naidoo says the group is being sprayed by ice cold water by Gazprom employees as they remain on the rig. “We want to draw global attention to what is the defining environmental struggle of our time, and time is running out for us to avert catastrophic climate change,” Naidoo says. “That’s why we are here.” Greenpeace is promoting a resolution at the U.N. General Assembly that would protect the Arctic region from any drilling or unsustainable fishing. why are they so violent against the oil projects, its for their own future too.